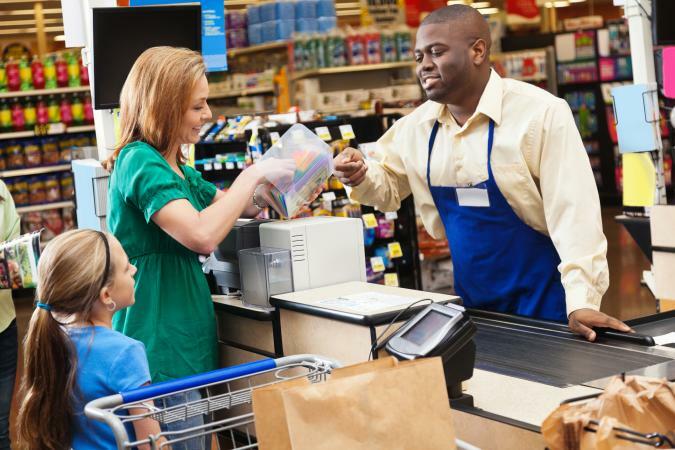 If you don't have a system for organizing your coupons, valuable coupons may expire while they sit by your desk, or you may not have them when it's time to make a purchase. The best option for an individual savvy shopper depends largely on the number and types of coupons you clip, but there are many types of coupon organizers you can create or purchase. A binder is often the best coupon organizer for heavy-duty savers who clip multiples of each coupon. After clipping, slide all of the coupons of the same type in a single card pocket. The baseball card collecting sheets let you see all of your coupons at a glance and easily flip from section to section. This type is used and recommended by many extreme couponers and top coupon bloggers, like those at The Krazy Coupon Lady and Cuckoo for Coupon Deals. You can create one of these yourself or buy a pre-made version like the one available from Raining Hot Coupons (about $40) complete with tabs and zippered pouches. A photo album is similar to a binder. Collect your coupons and slide them into the pockets on each page. However, a photo album offers larger pockets than baseball card collecting sheets. This means fewer coupons on a page, but it can also make your coupons easier to access. Fabulessly Frugal suggests this can be an easy way for beginning couponers to start out because it's one of the more simple options. 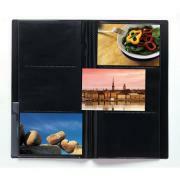 You can find photo albums with slip in pockets at Walmart as well as most drug stores. An index card box allows you to flip freely through your coupon selection. It's larger than most envelopes and sits flat in the front seat of a shopping cart, whereas other coupon organization systems can slide around. Dividers allow you to create as many categories as you need for the coupons you use most. The Happy Money Saver blog recommends this method because it's easy and inexpensive to create. This method is inexpensive and uses materials you already have around the house. You can include as many envelopes as necessary in your filing system and label them with categories that work for you. It's also easy to expand when you need it. Inspiring Savings calls this the "cheapest way to organize" when it comes to coupons. The folds of a small accordion-type organizer provide an easy way to file your coupons into different categories. It expands to accommodate many coupons. The downside to an accordion-style organizer is there are a pre-set number of sections, making it less flexible than some options. The Coupon Project recommends this type for quick trips and light coupon users for its portability and ease of use. The C-Line 13-Pocket Organizer (about $5) is a great option with a 4.4 out of five average star rating from reviewers, who praise it for being lightweight, easy to use, and inexpensive. The basic fabric wallet or envelope organizer has a fold-over top, usually secured with Velcro, and it includes dividers for labeling. This organizer is usually the best choice for most small-scale coupon users. Its small size fits in most purses, making it convenient to carry to the store. Hand-sewn versions are available from crafters (or you can create a DIY version on your own), and you can usually find manufactured ones in stores or for sale online. The Benton and Blair Damask Fabric Coupon Holder (about $15) is an excellent option with a high 4.8 out of five star average. Reviewers give it top marks for its sturdiness and style. An organizing method that puts your coupons right at your fingertips is a card caddy. These are usually made of fabric and have dividers. They attach to the front or seat of the cart, hanging so coupons are easily accessible. This type is one of the five best according to The Tough Nickel. A great example is the E-Z Coupon Holder (about $5), which was named as one of the best seven finds to make grocery shopping easier according to Real Simple. A coupon organizing solution that offer a stylish alternative is a cloth coupon bag. These hold many more coupons than a cloth coupon wallet and typically come in a boxy design with a handle and zipper. This is one of the preferred methods of Coupon Geek. You can find handmade versions of these online, such as the ones from Glow Girl Fibers. Etsy reviewers give the organizers high praise, saying they are well made and attractive. 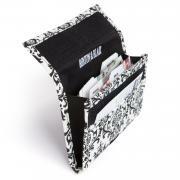 Make a fun and frugal option for toting coupons by making your own organizer out of Duct tape. Savvy, crafty couponers on YouTube not only love this method, but also offer up lots of ideas on how to make them yourself in different styles, including envelope and accordion versions. One of the simple methods, using a cute basket is one of the most clever coupon organization methods according to All You. Coupon blog The Frugal Girls lists this is one of the best coupon organizing options. The basket makes it attractive and you can easily customize it with DIY dividers. The Dough Roller lists digital apps among the best tools for the modern couponer. First up are apps that let you organize physical coupons, like SnipSnap, which lets you scan your paper coupons and turn them into digital ones and organize them online in the app. There are also apps like The Coupons App, which gives you access to and allows you to organize a variety of digital coupons. These can make organizing coupons easy and convenient.